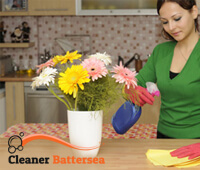 We are the leading provider of domestic cleaning services in Battersea. We take pride to offer very high standards when it comes to cleaning. Our cleaning teams are always at hand and ready to achieve only perfect results in their work. They put all their efforts to please you and meet your expectations. We supplied them with the top eco-friendly detergents, so that we provide one chemical-free and healthy cleaning for you. They will clean every nook of your house in no time and leaving only impeccable and stunning results. We guarantee about it and if you are not satisfied, we would like to provide us with the opportunity to re-clean the problematic zones. Our working schedule is flexible, so that we fit to the busy life of everybody. If your house is constantly in a mess and you have to spend the weekend in cleaning, then our domestic cleaning services may be a smart idea to save your time and spend it on more pleasant activities than scrubbing. The cleaning is not only a job for us, it is a passion, because we like to to see our customers smiling at the sight of their house after our visit. When we clean your home, it is the only thing of which we are thinking. We always strive for the best results and that’s why we use only non-toxic cleaning products in order to provide our customers in SW11 with a healthy atmosphere. We provide seasonal deep cleaning and regular weekly cleaning. No matter which one do you need, the perfect results are guaranteed. We stick to our words, so the perfect condition of your home is granted. All you need to do is grab the phone and contact our support centre. We provide our customers in Battersea, SW11 with our services everyday, including weekends. So, don’t hesitate to get in touch with us and book.